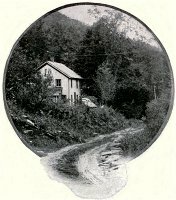 In that peculiarly picturesque region of the Catskills, with all the intrinsic charm of its many glorious haunts, one finds a to widely varied range of wild mountain scenery, that to votaries of nature it is a terrestrial paradise -- a sylvan retreat where all who enter may possess an Aladdin's lamp, to discover some new and unexpected treasure. Up in the grand old mountains dreaming the hours away. " In wonder and admiration the eye dwells upon the queer forms and shapes that Nature in her varied moods has carved in the massive walls of rock by which you are surrounded. The noise of the trip hammers from a quarry just below reaches your ears, and from a point of observation you watch the strong arm men, as their ponderous hammers descend upon the huge rocks, in what appears to you to be an endless task. In reply to your curious inquiry, a man pauses with uplifted hammer to inform you that comparatively few of these quarries are run on a large scale; but, like the one here, the greater number are worked by the associated effort of three or four men. With a farewell look at the quarry, you make your way down a winding, rocky path to the picturesque South Road, one of the oldest in this part of the country. Every now and then you pause to breathe in the pine scented air and, looking back at the steep precipice, where, on the bare rocks, the fir- and balsam-trees shoot upward toward the sky, you marvel how these trees derive their nourishment with their roots so fantastically overhanging the cliffs. On the vagrant breeze comes the dreamy sound of a waterfall. You follow its babbling murmur, until you come in view of a wild mountain stream which gushes from an opening in the cliff, and, leaping from rock to rock, plunges its foamy waters into an exquisite little lake. It is a place to enjoy the wild beauty of nature, a place where new thoughts, new inspirations are born. You will not leave the spot until it is been engraved like an intaglio upon your memory, so that at will you may recall the picture in all its pristine loveliness - the brilliantly blue sky, with the white, feathery clouds floating leisurely over the high blue peaks of the mountains; the huge rocks decked with emerald moss; the wild grape-vines twisting their coils and tendrils from tree to tree; the plunging and cascading of the waterfall; and the meteoric brightness of the lake glimmering beneath the noonday sun. In a dreamy mood you finally make your way back to the road, and idly wander until you reach the village post-office and general store. You gaze curiously at its barn-like appearance, at the queer characters congregated there. It is the noon-hour, and they're waiting for the one great event of the day, the arrival of the rural mailman--whose white horse can be seen coming leisurely up the road at a snail's pace. A smile curves your lips, as you mark the contrast between this raw-boned farmer, in his blue-jean overalls, and the city postman, in his spruce gray uniform. Nevertheless, in sunshine or storm, the rural mailman is as faithful as his city cousin. You ask this unique "Uncle Sam" how he likes traveling the mountain roads in stormy weather, and a mild look of surprise breaks over is on its features, as he strokes his chin and drawls: "O-h, I do-n't like it so ve-ry good". Then as you gaze around the strange little group you suddenly become interested in a little towheaded child, and wonder why she is so carefully guarding an egg she holds in her chubby fist; while with longing eyes she gazes at the small assortment of candy the store contains. Your curiosity is soon gratified, when you see the egg exchanged for an "all day sucker," and are told that pennies in this part of the country are scarce. When about to leave the post office store you stop, and wait for an old mountaineer who is coming down the road. You never miss an opportunity of having a chat with this patriarch of the village. Although his long thick locks and beard have been turned snowy white by Father Time, his broad shoulders are so little bent you can scarcely realized they have felt the weight of 95 years, until you recollect the you are in the region of Rip Van Winkle; and when you leave this old veteran, it is with the proud feeling that not every day are you privileged to meet a man who was fought in the Mexican as well as the Civil War. Sauntering on, your attention is attracted to an old sawmill standing somewhat back from the road. 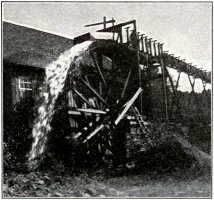 You listen to the ceaseless rumbling of the great water wheel as it rapidly revolves, throwing water back into the mountain stream, in a mass of feathery, white foam. A little further and you come upon a gigantic boulder, surrounded by silence, and solitude. The noise and bustle of city life is forgotten, a new world opens before you, and for once in your life you feel the great exultation of being "monarch of all you survey!" A strange sort a fascination steals over you; you listen intently to catch the softest whisper of Nature. When lo! from the deep umbrage of the woods nearby come seductive voices, which seem to be coaxing you into its wild embrace. One moment you hesitate, but the charm is too strong to be resisted; another moment, and the green walls of the forest have closed in upon you. Through the tangle of greenery overhead the light is sifted until it becomes a soft green Twilight. So obscure and spectral is it that it gives the place an almost awesome enchantment. The emerald moss gives no sound of your footsteps as you make your way through a labyrinth of underbrush, quite oblivious that it is of little suggestive of snakes, and only last night you heard that bears and even wild cats are occasionally seen in this vicinity. And pensively waft it along." The trees, the brooks, the winds, and the wild creatures of the forest have sung all day in your ears. Now, at its close, there is something indescribable in the pleasure and ecstasy you feel as you sit in the growing twilight and marvel at the grandeur and glorious sublimity of this enchanting sunset picture. Your strong, intent gaze is fixed upon the mountain where, high above all others, looms the Titan form of High Peak. Over it dark shadows are stealthily creeping, while, just behind, the dying sun sends up an unclouded blaze of fiery light. The lingering shadows lengthen until at last the giant's dusky robe is woven. Now it stands like some mighty volcano, as three broad shafts of crimson dart across the heavens, like ribbons of fire, rendered still more realistic by the deeply purple clouds floating low above the mountain. It is grand, wonderful, sublime--one of Nature's pictures, that no artist's brush has ever had the power to reproduce. You almost hold your breath as you intently watch the mountains, one by one, grow more and more indistinct, fading away until the dark form of High Peak alone is silhouetted against the still crimson afterglow of the sky. A long drawn sigh--then night and darkness reign. There's something in this Erebus darkness which makes itself felt. All weird legends of the red man who once lived in Rome among these mountain with began in your memory. So they do your imagination you almost expect to hear the wild will of the Indians, as his torch pierces the darkness, but all the vigilant eye can discover are busy fireflies searching through the blackness with their tiny electric torch it. Suddenly, as if by magic, the vast black canopy has changed to a star bespangled heaven. Then, slowly, moving silently like a ghost, the moon appears and, by the witchery of its pale, soft light, transforms the scene into the indescribable glory and beauty of fairyland. Under its mystic spell the silence is broken. The sighing of the night wind, the shrill song of the whippoorwill, the deep bass of the frog, the ceaseless cry of "katy-did! katy-did! katy-didn't! katy-didn't!" falls in a musical symphony around you. For every sound with its reverberating echoes mingles and blends in the perfect harmony of Nature's own wild, sweet lullaby. A drowsy feeling steals over you--and you pass from a land of dreams into the arms of Morpheus.